Jeffrey Sachs, UN Advisor on the Millennium Development Goals and Director of the Earth Institute at Columbia University, explains why 2015 is a critical year for global sustainable development. 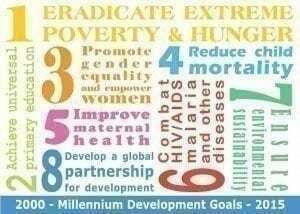 2015 marks the end of the Millennium Development Goals set in place in 2000, to be replaced with the adoption of the Sustainable Development Goals in September. In July Heads of State, government ministers, NGOs, and other institutional and global stakeholders will meet in Addis Ababa, Ethiopia for the third International Conference on Financing for Development. The conference will produce an internationally agreed plan to support and contribute to the post-2015 development goals. Then comes COP 21 in Paris. The two-week climate conference, starting on November 30, will finish the work began at COP 15, seeking to forge a solid international climate treaty. Sachs reconciles the peril and promise of our global condition with a call to action. Urging world leaders and people at all levels of society to carefully consider the options and possibilities of our decisions, Sachs firmly believes that, if we have the will, we can bend the arch of history toward a just and sustainable future.